You are at:Home»Travel»What you Can Learn from a Personal Trainer? Advertisements for personal trainers can be hard to miss. Anyone who spends even a minute amount of time in a gym may come across a business card highlighting a talented professional’s services. Regardless of the ad exposure, not everyone thinks he/she needs to work with a personal trainer. Many assume hitting the gym and exercising for a few days a week should be enough. Actually, without the proper guidance, achieving results in the gym may be impossible. Even those with a tremendous amount of desire and motivation could fall short of their goals. A personal trainer might provide the perfect assistance necessary for frustrated clients to see results. Through working with the right trainer, a client frequently gains knowledge that can be utilized during solo workout days. So, what exactly can you learn from a personal trainer? Scores of different workout and exercise programs exist. Choosing programs at random might deliver decent results, but this isn’t the right approach to maximize workout benefits. If increasing strength remains your top goal, performing high repetitions of isolation exercises and only hitting compound exercises at moderate weight levels won’t do much. A personal trainer may point out that strength gains become achievable with heavy compound lifts performed at relatively low repetitions. A novice to the gym might just pick a bunch of random exercises or routines with no logic or focus. Doing so over the course of several years may lead to the creation of an “experienced know nothing.” That is, the person put the time into his/her workout sessions but really doesn’t know how to exercise effectively. Seeking the help of a trainer allows you to avoid such conundrums. No matter what your goals are, an experienced personal trainer understands what type of program must be performed. Let us get something clear here: nothing can be done to reduce the chances of an injury to absolute zero. Any physical activity brings forth the potential to suffer an injury. This includes even light exercises. That said, means exist to reduce the chances of an injury. A personal trainer assists with cutting down on the potential for injury. Poor form and improper exercise performance contribute significantly to injuries. A qualified personal trainer doesn’t just run a client through exercises. The trainer explains how the exercises are performed. By instructing a client in proper form, the trainer decreases the possibility of injuries. Overtraining also causes injuries. Training too frequently, working out too hard, and not giving the body enough time to rest and recuperate might lead to strains, sprains, and tears. Sometimes, people become their proverbial worst enemies in the gym. Excess enthusiasm leads to making disastrous errors that cause injuries. A skilled personal trainer knows when to step in and tell a client he/she may be overdoing things. With the right instruction from the outset, a client might never go overboard or overtrain in the first place. You can only benefit from exercise when you actually exercise. Some may start out really strong and walk into the gym with tremendous motivation to work hard. As the weeks progress, motivation diminishes. Gym attendance becomes infrequent and stops altogether. Such is commonly the fate of those with no one to help motivate them. A personal trainer absolutely acts as a source of motivation. He/she understands coaching requires keeping people interested in making time for the gym. Often, the consistent results attained from working with a trainer support motivation. Sometimes, simple words of encouragement may be more than enough. 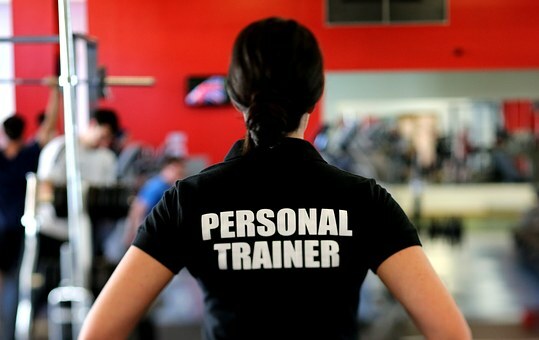 A personal trainer can teach you how to be a personal trainer. A lot of experience and knowledge may be gained from working with a personal trainer. You might also feel that you could do the same job and make a decent part-time income. Working with a personal trainer for an extended period of time may lead to learning the right ways to train someone. Too many people train themselves and then try to train others. Only through directly experiencing how a personal trainer does his/her job can you learn the best way to perform the duties yourself.